This lovely dress features lace overlay and a classic fitted bodycon shape. The Larissa Lace Bodycon Dress is fully lined below the bust. It has a V neckline, wide straps, and a curve-hugging shape. 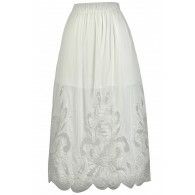 Textured lace overlay adds the perfect girly touch to an otherwise simple dress. This dress would look great paired with pumps or strappy heels on your next night out with friends. Fit note: This dress runs extremely small; consider sizing up. Details: Made in USA. Lined below bust. 58% nylon, 40% polyester, 2% spandex. Lining: 100% polyester. Hand wash with cold water. Do not bleach. Hang or line dry. Small measurements: Length from top of bust to hemline: 37”. Bust: 28”. You have added Larissa Lace Bodycon Dress in Peach into Wishlist. 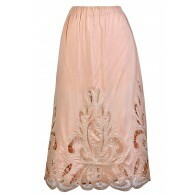 You have added Larissa Lace Bodycon Dress in Peach for Stock Notification. 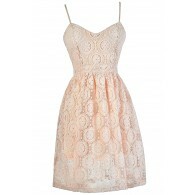 You have set Larissa Lace Bodycon Dress in Peach as a loved product. 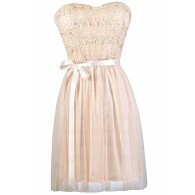 You have removed Larissa Lace Bodycon Dress in Peach as a loved product.